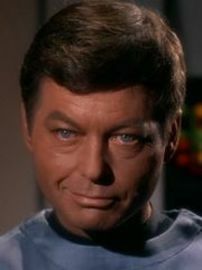 Leonard H. "Bones" McCoy is a character in the science fiction franchise Star Trek. First portrayed by DeForest Kelley in the original Star Trek series, McCoy also appears in the animated Star Trek series, six Star Trek movies, the pilot episode of Star Trek: The Next Generation, and in numerous books, comics, and video games. Karl Urban assumed the role of the character in the 2009 film Star Trek, its 2013 sequel Star Trek Into Darkness and 2016 sequel Star Trek Beyond.